Lately, August's name has been popping up on a lot of baby name lists which, even if they aren't accurate, are at least drawing attention to the name which could trigger a rise in popularity. I have mixed feelings about this and I'm not the only one. In fact, many of my friends are noticing their "unique" names popping up on these lists. The baby boomer generation (our parents) always seems to be surprised by what my friends and I are naming our children. "Oh I've never heard of that" is a common comment. But names that seem unique, even strange to them, in reality are actually becoming quite common. This could just be the way name trends naturally happen. For example, my mother SWEARS that "Matthew" was not a common name when she chose it for my brother, but he was always one of several Matts in his classrooms. Another explanation might be that the name was always around but we just fail to notice it as much until it's your kid. Since August was born our family has noticed characters in movies and books that have been around for a long time, and even discovered distant relatives with the same name. I find names to be very interesting. Why we choose names, their purpose, how they vary culture to culture---it's all really fascinating to me. Name trends are something I read up on a lot before I got pregnant. My goal was to choose a name that wasn't weird (nothing I made up or he'd hate me for) but was unique. This desire was a result of really liking my name which I consider to be pretty unique (I've never had a friend named Noelle) but also normal (everyone knows the name, I've HEARD of other people named Noelle). We chose August in part because I felt it was just such a name. August was a very popular name at one time (think late 1800s) that went out of vogue to the point of no one having heard of it, and now it seems to be making a little come back. Naturally, it can be a little disheartening to think you came up with the perfect, unique name only to discover that it's jumping up the charts. But as someone who regularly looks at the data, I have found some solace in the fact that a trend towards uniqueness means that even popular names are being used less than the popular names of the past. For instance, in 1957, the number one baby name for a boy was Michael. Over 90,000 babies born in 1957 were named Michael. Compare that to 2013 when the top baby name for a boy was Noah and represented only a little over 18,000 babies born. Yes, there were more babies born overall in 1957, but even when comparing percentages it's still a drastic difference. So yes, Noah is the number one name, but it's less common than that implies since names are much more diverse these days overall. 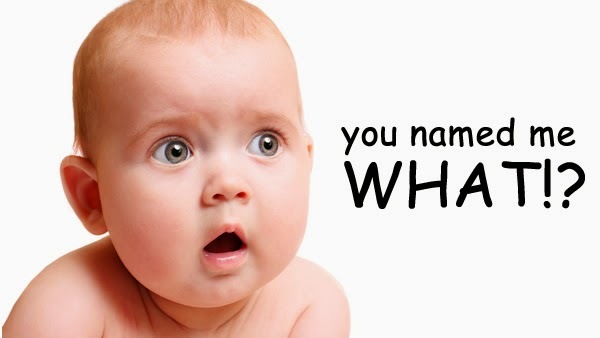 If your name is outside the Top 20, or even better the Top 100, chances are you won't encounter too many kids in the classroom who share your child's name. You'll hear of other kids named the same thing, maybe even meet a few, but no name will dominate in the way names have dominated past generations. (Fun fact: Michael has been in the Top 3 for like 50 of the last 60 years...that's a lot of Michaels). So take heart current and future parents! Even if your not-as-unique-as-you-thought name shows up on these lists---it's not as bad as it sounds. And if you REALLY want your child to be unique, consider naming them one of those oh-so popular names from your generation because, while misguided, they are being avoided in mass. Powered by Blogger. Design by Fifth of August.